While the cutting techniques of the ancient pyramid builders have been a continuing topic for debate, they have not received the same attention and controversy as the proposed methods that were used to lift and transport huge cyclopean blocks of stone. While Egyptologists and orthodox believers in primitive methods argue that the huge blocks were moved and put into place using only man power, experts in moving heavy weights using modern cranes throw doubt on the subject. My company recently installed a hydraulic press that weighed 65 tons. In order to lift it and drop it through the roof, they had to bring in a special crane. The crane was brought to the site in pieces and was transported from 80 miles away over a period of five days. After 15 semi-trailer loads, the crane was finally assembled and ready for use. As the press was lowered into its specially prepared pit, I asked one of the riggers about the heaviest weight he had lifted. He claimed that it was a 110-ton nuclear power plant vessel. When I related to him the 70 and 200 ton weights of the blocks of stone used inside the Great Pyramid and the Valley Temple, he expressed amazement and disbelief at the primitive methods that are promoted by Egyptologists. For many, it is enough just to argue the issue from a logical standpoint. For others, the subject becomes more meaningful when a proposed method is demonstrated and proven to be successful. There is only one man in the world who, by demonstration, has supported the claim, I know the secret of how the pyramids of Egypt were built! The man is now deceased. 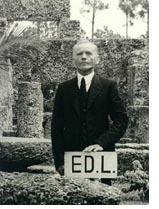 The claim was made by an eccentric Latvian recluse named Edward Leedskalnin. An immigrant to the United States of America, Leedskalnin devised a means to single-handedly lift and maneuver blocks of coral weighing up to 30 tons each. 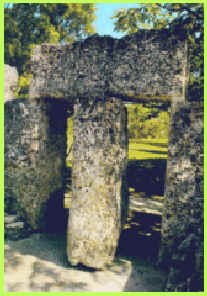 In Homestead, Florida, using his closely guarded secret, he was able to quarry and construct an entire complex of monolithic blocks of coral in an arrangement that reflected his own unique character. 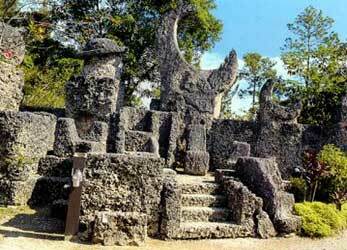 On average, the weight of a single block used in the Coral Castle was greater than those used to build the Great Pyramid. He labored for 28 years to complete the work, which consisted of a total of 1,100 tons of rock. What was Leedskalnin's secret? Is it possible for a five-foot tall, 110 pound man to accomplish such a feat without knowing techniques that are uncommon to our contemporary understanding of physics and mechanics? Leedskalnin was a student of the universe. Within his castle walls, built of coral blocks weighing approximately 15 tons each, he had a 22-ton obelisk, a 22-ton moon block, a 23-ton Jupiter block, a Saturn block, a 9-ton gate, a rocking chair that weighed 3-tons, and numerous puzzles. A huge 30-ton block, which he considered to be his major achievement, he crowned with a gable shaped rock. These personal accomplishments have astounded and surprised many engineers and technologists, who compare them with those achieved by workers handling similar weights in industry today. For his miracles of construction engineering, Leedskalnin received attention not only from engineers and technologists, but from the U.S. government, who paid him a visit hoping to be enlightened. Leedskalnin received them gracefully, and they left none the wiser. In 1952, falling ill and on his last legs, Leedskalnin checked himself into the hospital and slipped away from this life, taking his secret with him. If we assume that Leedskalnin and the ancient pyramid builders were using similar techniques, it puts a whole different light on the requirements in man hours necessary to construct the Great Pyramid. Estimates for the number of workers that built the Great Pyramid range between 20,000 and 100,000. Though it should be noted that the precision to which Leedskalnin worked his coral was not the same as that worked on the pyramid stone, based on the abilities of this one man, quarrying and erecting a total of 1,100 tons of rock over a time span of 28 years, the 5,273,834 tons of stone built into the Great Pyramid could have been quarried and put in place by only 4,794 workers. Figure in the efficiencies gained from working in a team, the division of labor, and we can reduce the number of workers and/or shorten the time needed to do it. Let's not forget Mr. Merle Booker (deceased) of the Indiana USA Limestone Institute, who prepared an estimate for the delivery of enough limestone to build a Great Pyramid. Using the same criteria, with respect to size and quantity, as the ancient pyramid builders, but using modern equipment, his estimate included tripling the average output of all 33 Indiana limestone quarries. The estimate did not factor in any equipment failures, labor disputes or acts-of-God. He estimated that twenty seven years after the order was placed, the last stone would have been delivered! 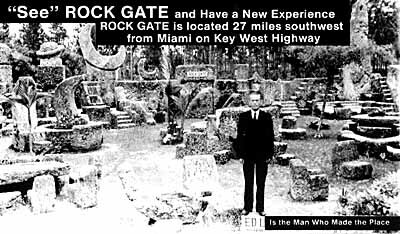 I first visited Coral Castle in 1982. It soon became clear to me that Ed's claim was accurate. He did indeed know the secrets of the ancient Egyptians. I returned to Homestead again in April 1995 to refresh my mind and, specifically, to closely examine a device which, in 1992, fueled a discussion between myself and an engineer colleague, Steven Defenbaugh, resulting in a speculation as to the methods Leedskalnin was using. Leedskalnin took issue with modern science's understanding of nature. He flatly states that they are wrong. His concept of nature is simple. All matter consists of individual magnets and it is the movement of these magnets within materials and through space that produces measurable phenomena, i.e., magnetism and electricity. Whether Leedskalnin was right or wrong in his assertions, from his simple premise he was able to devise a means to single-handedly elevate and maneuver large weights which would be impossible using conventional methods. There is speculation that he was employing electromagnetism to eliminate or reduce the gravitational pull of the earth. These speculations are entertained by some and scoffed at by others, who have feet which are firmly planted in the real world. While at Coral Castle, I commented to a lady standing in Leedskalnin's workshop that it was quite a feat he had performed, and asked if she had any idea how he had done it. Fixing me with a measured look, she stated, through the application of physics and mechanics such work can be done. Somehow sensing my esoteric bent, she commented that Thor Heyedahl had dispatched wild speculation about how the huge stone statues on Easter Island were put in place when he reenacted the work by carving, moving, and erecting one. Being alone, and wanting a photograph taken of myself in Leedskalnin's workshop, I didn't want to be argumentative. Smiling, I handed her the camera and didn't point out that Heyerdahl, unlike Leedskalnin, had an ample supply of willing and healthy natives, therefore sufficient man power to satisfy the physical requirements for conventionally moving such large weights, even on rollers, and cantilevering them into an upright position. He was an energetic man, but, using these methods, Heyerdahl couldn't have done it alone. Moreover, Heyerdahl merely demonstrated that the job can be done using one particular method. Anyone who has worked in manufacturing knows that there are many ways of doing things. To devise a means to perform a given work and present it as the only way that such work could be done gives little credit to those who either a.) might know a better way, or b.) might look for a better method, and succeed in finding one. When analyzing ancient engineering feats, and faced with explaining technically difficult tasks, Egyptologists and archaeologists typically throw in more time and more people using primitive, simple tools and manpower. Unlike conventional arguments regarding ancient civilizations, in the case of Ed Leedskalnin, we cannot impose the view that the work was done employing masses of people, for it is well documented that Leedskalnin worked alone. Egyptologists claim to know how the Great Pyramid was built. To prove it, they built a small pyramid consisting of stones no heavier than 2-1/2 tons that were hefted into place using a gang of workers, straining on ropes. (See This Old Pyramid, NOVA with Mark Lehner and company.) Leedskalnin claimed to know how the Great Pyramid was built, and to prove it he moved a 30-ton and other monolithic blocks of coral to build his castle. It's too bad the cameras weren't on Leedskalnin as they were on Lehner and company. I believe that Leedskalnin's feat would be more descriptive of the pyramid builders methods than Lehner's. What follows is speculation that attempts to follow Leedskalnin's basic premise regarding the nature of electricity and magnetism to a conclusion that has some semblance of logic. The speculation follows some basic rules for brainstorming. There's no such thing as a stupid idea. What we have been taught about the subject may not necessarily apply when seeking and, hopefully, finding a real solution. A paradigm shift in my perception of anti-gravity occurred when Defenbaugh and I were discussing the subject with Judd Peck, the CEO of the company for which we both work. Peck asked the simple question What is anti-gravity? In an attempt to describe anti-gravity I had to say A means by which objects can be lifted, overcoming the gravitational pull of the earth. It then occurred to me that we were already applying anti-gravitational techniques in our everyday life. When we get out of bed in the morning we employ anti-gravity. An airplane, rocket, fork-lift truck and an elevator are technologies devised to overcome the effects of gravity. Even a car rolling along on its wheels is an anti-gravity device. Without the wheels and a propulsion system, it would be just dead weight. I realized that I had been laboring under the assumption that, in order to create an anti-gravity device, gravity should be a known and understood phenomenon and, through the application of technology, out-of-phase gravity waves can be created in such a manner to neutralize it. The nature of gravity still eludes us, as well as the production of interference gravity waves. Perhaps this concept is too complicated! What if there's no such thing as gravity? And the natural forces we already know about are sufficient to explain the noted phenomena we have labeled as gravity? If, as Leedskalnin claims, all matter consists of individual magnets, wouldn't the known properties of a magnet be sufficient? We know that like poles repel and unlike poles attract. We also know that we can suspend one magnet above another as long as we don't allow either of them to flip over so that the opposite poles attract each other. Magnets seek to attract and, left to themselves, will align their opposite poles to each other. Consider the magnet that is made to suspend above the other. A mag-lev train is a good example of an antigravity device. If a large magnet is suspended over a smaller magnet, depending on the ratio between them, the distance between the magnets would be diminished to the point that the smaller magnet wouldn't be able to exert enough force to elevate it. The earth, being the largest magnet, issues forth streams of magnetic energy which follow lines of force that have been noted for centuries. If we assume, as Leedskalnin did, that all objects consist of individual magnets, we can also assume that an attraction exists between these objects due to the inherent nature of a magnet seeking to align an opposite pole to another. Perhaps Leedskalnin's means of working with the Earth's gravitational pull was nothing more complicated than devising a means by which the alignment of magnetic elements within his coral blocks was adjusted to face the streams of individual magnets he claims are issuing forth from the Earth with a like repelling pole. A known method for creating magnetism in an iron bar is to align the bar with the Earth's magnetic field and strike the bar with a hammer. This vibrates the elements in the bar and allows them to be influenced by the magnetic field they are in. The result is that when the vibration stops, a significant number of the atoms have aligned themselves within this magnetic field. Was this the method that Leedskalnin was using? It's a simple concept, but looking at the devices in Leedskalnin's workshop, I can easily imagine the application of vibration and electromagnetism. His fly-wheel for creating electricity remains motionless, for the most part, until inquisitive tourists like me come along and give it a spin. After a few revolutions, I realized that something was missing. The narrative I had heard, while browsing around the castle, described Leedskalnin as using this device to create electricity to power his electric light bulbs. It was claimed that Leedskalnin didn't have electricity, but I couldn't imagine this device being a useful and continuing source of power, using only Leedskalnin's right arm to turn the wheel. On closer examination of this piece, I found that the whole assembly was actually an old 4-cylinder crank case. His flywheel was mounted on the front end of the crankshaft and consisted of bar magnets that were sandwiched between two plates, the upper plate being a ring gear. Giving it weight and solidifying the entire assembly, Leedskalnin had encased the bar magnets with cement. It then occurred to me that the photo of Leedskalnin with his hand on the crank handle, which is attached to the end of the shaft, may not accurately represent his entire operation. It is possible that Leedskalnin was using the crank handle to start a reciprocating engine, now missing, which attached to one of the throws on the crankshaft. He would then be able to walk away and leave his flywheel running. I was now mystified. I had developed a notion that the bars attached to the flywheel were actually being used to develop vibration in the piece Leedskalnin was trying to lift. This idea didn't make sense after looking at the type of material, size and weight of the entire assembly. The crankcase was firmly attached to the coral block in his workshop, and even if it wasn't attached, it would be quite a feat to keep moving it about. There was one factor I needed to check out, though, before I headed back to Illinois. I had tested the bar magnet with a pocket knife. The knife was attracted to each bar. I needed to know, conclusively, the arrangement of the poles in the wheel, to see, indeed, whether the assembly was capable of creating electricity. Leaving the workshop and absorbing the penetrating rays of the Florida sunshine, I headed for the nearest strip mall to look for a hardware store so that I could buy a bar magnet. North on Route1 I found a Radio Shack. They had just what I needed, and for only $1.75. Feeling rather pleased, I swung back onto Route 1 and returned to Coral Castle. Once there, I headed back into Leedskalnin's workshop and put the magnet to the test. I held the magnet a short distance away from the spokes of the flywheel while giving it a spin. Sure enough, I found out what I had come for. The magnet pushed and pulled in my grasp as the wheel rotated. Looking around the room, I gazed at a jumble of various devices, lying, hanging and leaning about the room. There were radio tuners, bottles with copper wire wrapped around them, spools of copper wire and other various and sundry plastic and metal pieces that looked like they had fallen out of an old radio set. Leedskalnin's workshop also contained chains, blocks and tackle and other items that one might find lying around a junkyard. Some items are missing, though. Photographs of Leedskalnin at work show three tripods, made of telephone poles, that have boxes attached to the top. These objects, however, are not to be found at Coral Castle. What is striking here, is that the block of coral being moved is seen off to the side of the tripod. Perhaps Leedskalnin had moved the tripod after raising the block out of the bedrock. Though another interesting observation is that the block and tackle that can be found inside his workshop are nowhere to be seen in this photograph. There are spools of copper wire in his workshop, and there were also two wrappings of copper wire. One was round copper and the other flat copper. In a narrative that visitors can hear at various recording stations around the compound, it is stated that at one time Leedskalnin had a grid of copper wire suspended in the air. Looking at the photograph, again, one can see that there is a cable draped around the tripod and running down to the ground. Perhaps the arrangement of tripods was more related to the suspension of his copper grid than the suspension of block and tackle. I have no doubt that Leedskalnin told the truth when he said he knew the secrets of the ancient Egyptians. Unlike those who have sought publicity for their own inadequate, though politically correct, theories, he proved it by his actions. I believe, also, that these techniques can be rediscovered and put to use for the benefit of mankind. Edward Leedskalnin, right or wrong, had a little bit of a problem with trust. This modus operandi was not unusual for a craftsman of his day. Proprietary techniques without patent disclosure assure continued employment and, therefore, it was perfectly normal that he would protect his secret from prying eyes that might steal and profit from it. I believe there are enough pieces there to put together and replicate his technique. It's been done once (sorry, twice), and I am sure that it can be done again!